The Presidential Bond Commission has decided to summon Prime Minister Ranil Wickremesinghe to appear before the Commission on 20th November. Accordingly, Prime Minister Ranil Wickremesinghe will appear before the Bond Commission following the mention of his name by persons produced before the Commission. 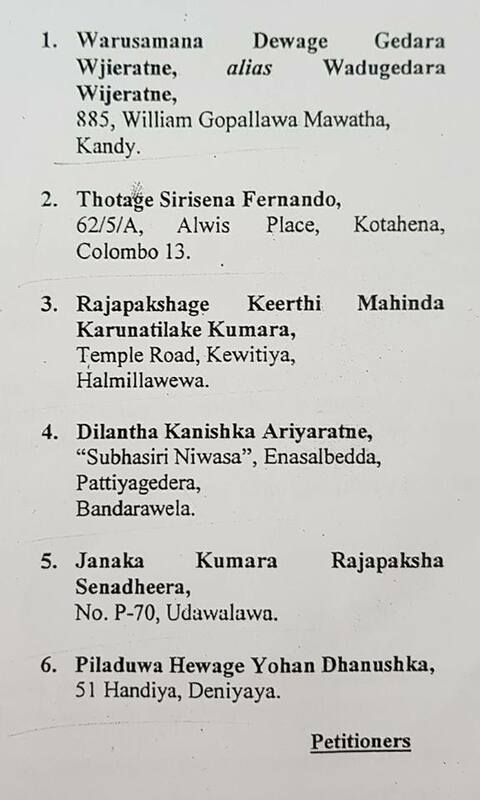 Six persons filed a petition yesterday (15th) with the Court of Appeal seeking to invalidate the Gazette notification issued on the demarcation of wards of Local government councils and it was revealed in Parliament that it was a move engineered by the Maithri faction of the SLFP. The person that has come forward as a petitioner from Matara District is Yohan Danushka, a coordinating secretary of the Provincial Councilor Pasanda Yapa Abeyawrdene, the son of State Minister Lakshman Yapa Abeywardene revealed Parliamentarian Kanchana Wijesekera. The petitioner from Panduwasnuwara in Kurunegala District is a person associating the Minister of Sports Dayasiri Jayasekera and is a candidate who is to contest the local government election from Panduwasnuwara electorate. Also, the petitioner who has come forward from Bandarawela District is an employee of the Road Development Authority under SLFP Parliamentarian Dilan Perera and it was revealed that the other three petitioners too have been put forward by the SLFP. Mr. Dilan Perera responding to the accusation says the Road Development Authority doesn’t come under his purview and those from the Road Development Authority are contesting from the new political party. The Leader of the JVP and the Chief Whip of the Opposition Anura Dissanayaka said despite the Road Development Authority didn’t come under the State Minister Dilan Perera, the petitioner is not only an official of the RDA but is also a resident of Hali – Ela. Mr. Dissanayaka said those who were attempting to get the LG elections postponed have been exposed and the shameful act cannot be concealed. The second reading of the Budget-2018 was passed in Parliament with a majority of 93 votes. 151 members voted in favour while 58 members voted against. The TNA voted with the government for the budget while the JVP and the MPs of the ‘joint opposition’ voted against it. The Committee Stage debate on the Budget proposals would commence tomorrow (17th) and is scheduled to continue until 9th December. It was revealed in the Presidential Commission to inquire into the Central Bank bond today (16th) that five members of the Committee On Public Enterprises (COPE) have had telephone conversations with Arjun Aloysius. This was revealed when two officers of the CID, who had carried out investigations in connection with the bond scam that had been committed when Mr. Arjun Mahendran was the Governor of the Central Bank, were summoned to the Commission to give evidence. A report that included a document containing relevant telephone conversations was presented to the Commission by the CID. Sujeewa Senasinghe, Dayasiri Jayasekera, Ajith P. Perera, Harshana Rajakaruna and Hector Appuhamy are COPE members who have had telephone conversations with Arjun Aloysius according to this report. According to the information revealed by the CID Minister Dayasiri Jayasekera had talked over the telephone to Mr. Arjun Aloysius, the owner of Perpetual Treasuries Ltd., twice, the State Minister Sujeewa Senasinghe had talked to the Perpetual Treasuries owner 62 times, Deputy Minister Ajith Perera twice, Parliamentarian Hector Appuhamy 23 times and Parliamentarian Harshana Rajakaruna 23 times. Among these five Messrs. Ajith P. Perera, Harshana Rajakaruna and Hector Appuhamy are members of the famous ‘footnote’ clique. The Court of Appeal announced today (16th) that the decision whether to hear or not the petition filed against gazette notification on Local Government delimitations would be announced on 22nd November. This was when the relevant petition was taken up today. Political parties, election monitoring organizations and the Election Commission have come forward to oppose the petition as third-party interventions. Many more political parties and organizations have come forward to make third-party interventions when the hearing of the petitions filed to get the forthcoming local government elections postponed take place today (16th). The JVP announced yesterday that it will make a third party intervention when the petition is heard today stating that the conspiracy to get the local government elections postponed should be defeated. Among the parties that have come forward is the Elections Commission. Election monitoring organizations, several other organizations and political parties have come forward to make third-party interventions. The attempt by the petitioners who filed a petition in the Court of Appeal yesterday (15th) to get the forthcoming local government election postponed is a move to deny the democratic rights of all the people in the country and the party would come forward against the sordid move states the JVP. As such, the JVP hopes to make a third party intervention when the petition is heard today (16th). The Member of the Central Committee of the JVP and Western Provincial Councilor Attorney at Law Sunil Watagala said already the necessary legal mediation has been carried out. It is also reported that the JVP would rally the masses against any attempt by the government or any other sections to sabotage holding the election that has been postponed for more than 2 ½ years.